A few rounds of a popular puzzle game could keep the 50+ crowd feeling sharp. Did you know that casual gaming has societal benefits beyond just killing time and raking in massive piles of cash? According to a new study, adults over the age of 50 who play PopCap's Bejeweled Blitz felt more alert and had better cognitive focus than before. These findings indicate that casual games could have a bright future as effective, engaging tools for staving off - or even erasing - the deleterious mental effects of aging. 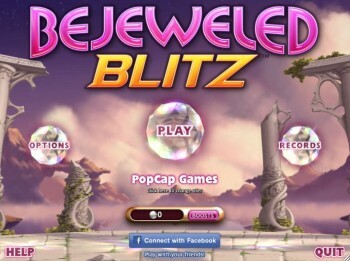 PopCap Games (makers of Bejeweled Blitz among many other casual titles) devised the study in conjunction Dr. Susan K. Whitbourne from the University of Massachusetts Amherst. Psychology Today magazine recruited over 10,000 adults from 18 to 80 via their website. These participants completed a survey, where they described their experience with Bejeweled Blitz and their subsequent mental states. 42.7% of adults over 50 described that they felt "sharper" while performing other tasks post-game. In addition, 22-24% of adults over 65 claimed that they were better able to perform timed tasks and recognize patterns post-game. The study itself is not exactly scientific, since there was no control group and participant response was subjective rather than tried under laboratory conditions. Furthermore, since the study comes by way of the game's developer, it's best to take it with a grain of salt. That being said, if videogames can keep people's minds limber well into middle age and beyond, this topic merits further research. "The best cognitive aging intervention in the world is useless if older adults aren't willing and able to engage in it," says Dr. Steven Boot, a psychologist at the University of Florida. "By investigating attitudes and perceived benefits of video game interventions, this research has the potential to discover game interventions that are both effective and enjoyable."